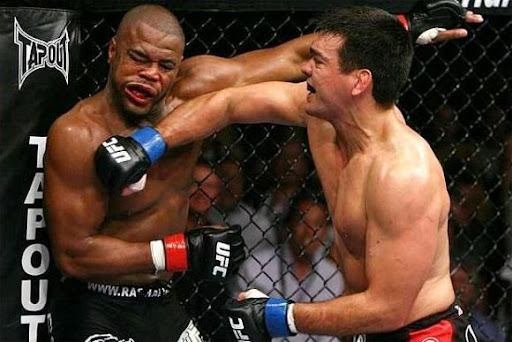 Light Heavyweight Championship bout: Lyoto Machida defeated Rashad Evans via KO (punch) at 3:57 of round 2 to win the UFC Light Heavyweight Championship. Lyoto Machida was awarded a $60,000 bonus for Knockout of the Night. Rashad's strategy was what I suspected, but I thought it might lead to a much more boring fight. Rashad looked good, but Machida looked amazing. I'm a hudge Machida fan because of that night. I couldn't sit still, the energy just simply blew my mind. Anybody else notice that Machida was doing just straight karate? Really redeemed karate in my eyes. I agree Tom, but its also important to remember that while Machida was able to rely strictly on his karate against Rashad, that's not always the case. We've seen him use his sumo skills against Tito and his BJJ submissions against R.T.S. I heard someone say recently "it's not the style you train in, but how you train in the style" and I think that holds true here. While Lyoto Machida and Anderson Silva show the potential with their styles, they are extreme case studies.